Search for locations with minimal light pollution to see an amazing light show. As an inky dark sky becomes harder to find, head to parts of the world where you can see the heavens shine. You’ve never really considered how infinitesimally small and insignificant you are until you’ve had a proper look at the night sky. And you’ve not seen nature’s most spectacular achievements until you’ve peered through an astronomical telescope and seen the rings of Saturn or the Crab Nebula, the dramatic remains of an exploded star. But to witness such wonders of the night sky it has to be very dark and very clear, something that’s becoming increasingly rare. 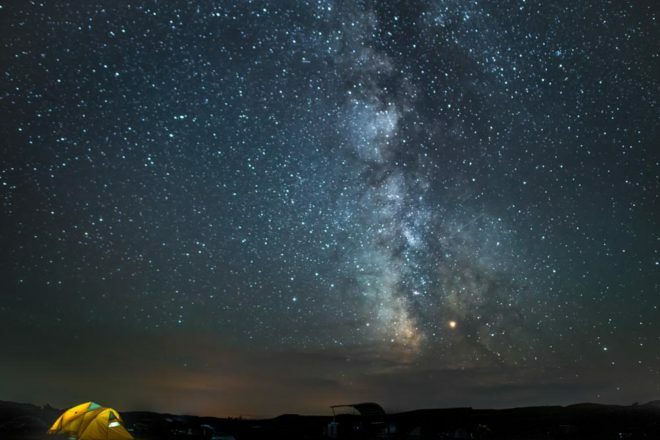 The International Dark-Sky Association is a kind of UNESCO World Heritage of the skies, working to identify exquisitely dark locations to protect them from the encroaching light pollution of urban sprawl. Australia received its first Dark Sky Park at Siding Spring, NSW, in 2016, and you’ll find such sites all over the world. There are Dark Sky Reserves (like national parks for dark skies), as far afield as Exmoor, England; the NamibRand Nature Reserve, Namibia; and Pic du Midi, France. At The Hermitage Hotel in Aoraki/Mt Cook National Park, for instance, which sits in an International Dark Sky Reserve, a team of astronomers will show you the stars through some seriously expensive telescopes. Having watched a demonstration in the hotel’s state-of-the-art planetarium, you’ll head out to see wonders like the unmistakable fur hood and cosy face of the Eskimo Nebula, the Milky Way carving a magnificent path overhead. Indeed, in November the New Zealand government announced that it had awarded the Tekapo region on South Island $3 million to help fund and develop its dark-sky tourism, which has been booming in recent years. So, next time you plan a trip, consider what your destination has to offer when the sun sets too, and find out just how small you really are. You don’t have to go by the official guide. Here, some of the places we’ve been in awe of the heavens on our travels. 1. Serengeti, Tanzania: On the vast African plains that constitute the Serengeti, the stars stretch from horizon to horizon. It’s not all about big game spotting out here; come nightfall take the time to consider the ocean of stars overhead. 2. Atlas Mountains, Morocco: Hike up into the High Atlas range and you’ll find the remote mountain villages of the Berber people. Here, thousands of metres up, the air is nearly completely clear and the night pitch black; gaze up at infinite points of light, like scattered diamonds. 3. Stromboli, Sicily: Head to the northern slopes of the impressive (active!) volcano that constitutes the small Sicilian island of Stromboli and you’ll be shielded from what little light pollution there is for views of an unforgettable starry night. 4. Anywhere outside Reykjavik, Iceland: Being at such a high latitude, on the cusp of the Arctic Circle, Iceland’s night sky has an extra treat in store. If you’re lucky enough to have a cloudless sky you may see the swirling form of the Aurora Borealis, like ghostly curtains of light hanging in the sky, a once-in-a-lifetime experience.